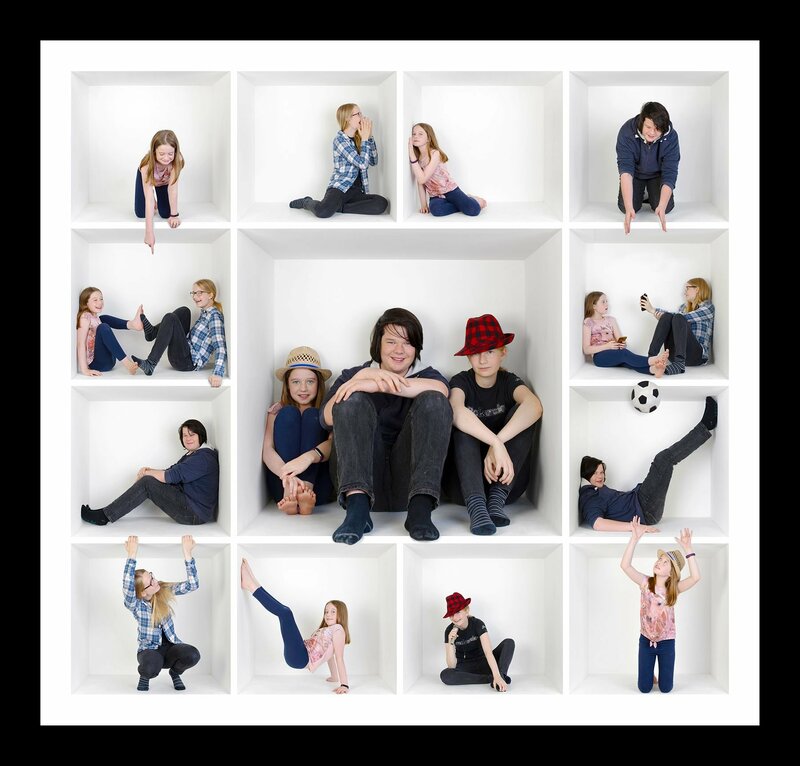 The original home of the 'Box' photo shoot idea, if you are looking for something a little different and fun for the whole family why not book one of our Photo Box sessions! Box Sessions are a fun and creative way of getting photos that really show a person’s personality. Kids love to play in the box, and adults do too! The whole family can let their wild side run free, bearing in mind that what ever happens in the box, stays in the box! The entire session is completed within the box. Our photographer then puts his artistic skills to work to create a unique piece of art which will look amazing up on your wall, a centerpiece for any modern home, and a talking point for years to come. The box session is for everyone to enjoy including the kids, parents, grandparents, and even your family pet. We offer a selection of props such as sunglasses and hats, but you can also bring your own props that reflect your own personalities if you wish. Remember this is your box collection so make it as unique as you are and wear your favourite outfits, and bring along your favourite props and children's toys to make it even more unique. We offer a choice of 4 sizes of 21" x 20", 25" x 16", 28" x 12" and 30" x 11" with various layout options, all at one set price. The size relates to the internal measurements of the frame. Your preferred size and layout can be discussed with our photographer at your box session photo shoot. 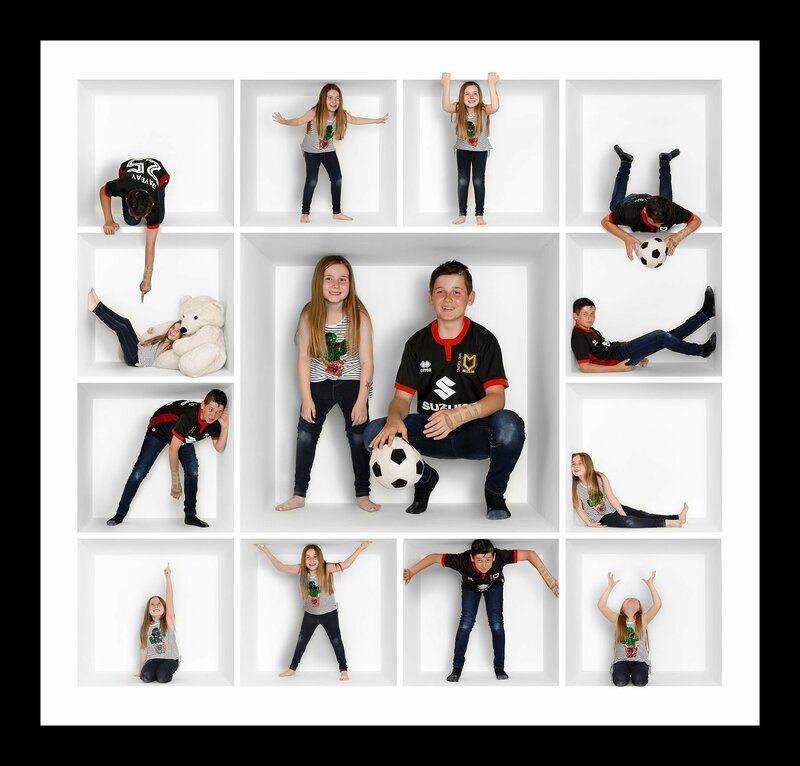 Additional single box framed images can be purchased and ordered at your viewing session. These make great additions to compliment your framed box collection. All our printing and framing is done in-house by professional picture framers and is made to the highest standard possible. Our box collection photo shoot is priced at £249 and includes:- Your photo shoot, the talent of our photographer creating a beautiful piece of art for your wall, your viewing session, and your final piece of artwork beautifully framed in your choice of frame ready to take pride of place in your home. These can also be printed on canvas and framed in a floating frame for the same price of £249. To book your sitting please call our photographer Stuart Runham today on 01234 363914, or book using the link below. A £50 deposit is required at the time of booking to secure your photo shoot.